Enviar solicitação de disponibilidade with your requested dates to the The Breakers Palm Beach. Casually-elegant guest room features one king bed and a marble bathroom. The room features Breakers resort views and is perfect for guests looking for exceptional value. Maximum two guests can occupy this room category; no rollaways permitted. Guest-room experience includes a Flat screen TV and DVD/CD player, alarm clock, in-room movies, in-room check-out, WiFi, mini bar, hair dryer, private electronic safe, The Breakers private-label toiletries, plush bathrobes and slippers, luxury linens and duvets. Casually-elegant guest room features two double beds and marble bathroom. The room features Breakers resort views and is perfect for guests looking for exceptional value. Maximum two guests can occupy this room category; no rollaways permitted. Guest-room experience includes a Flat screen TV and DVD/CD player, alarm clock, in-room movies, in-room check-out, WiFi, mini bar, hair dryer, private electronic safe, The Breakers private-label toiletries, plush bathrobes and slippers, luxury linens and duvets. Luxurious guest-room with full ADA Approved Access features one king bed and wheel chair accessible bathroom. The room features Breakers resort views. Maximum two guests can occupy this room category; no rollways permitted. Guest-room experience includes a Flat screen TV and DVD/CD player, alarm clock, in-room movies, in-room check-out, WiFi, mini bar, hair dryer, private electronic safe, The Breakers private-label toiletries, plush bathrobes and slippers, luxury linens and duvets. Casually-elegant guest-room with full ADA Access features two double beds and wheel chair accessible bathroom. This room features roll-in shower, shower and commode ADA rails, lowered sinks and Breakers resort views. For any additional needs, please contact The Breakers Reservations directly. Maximum two guests can occupy this room category; no rollaways permitted. Club Level available, please call for details and pricing. Guest-room experience includes a Flat screen TV and DVD/CD player, alarm clock, in-room movies, in-room check-out, WiFi, mini bar, hair dryer, private electronic safe, The Breakers private-label toiletries, plush bathrobes and slippers, luxury linens and duvets. Casually-elegant guest room features two double beds and a marble bathroom. This room suits travelers looking for a moderate room with great views. Maximum two guests can occupy this room category; no rollaways permitted. Guest-room experience includes: Flat screen TV and DVD/CD player, alarm clock, in-room movies, in-room check-out, WiFi, mini bar, hair dryer, private electronic safe, The Breakers private-label toiletries, plush bathrobes and slippers, luxury linens and duvets. Casually-elegant guest room features one king bed and marble bathroom. This room suits travelers looking for a moderate room with great views. Maximum two guests can occupy this room category; no rollaways permitted. Guest-room experience includes: Flat screen TV and DVD/CD player, alarm clock, in-room movies, in-room check-out, WiFi, mini bar, hair dryer, private electronic safe, The Breakers private-label toiletries, plush bathrobes and slippers, luxury linens and duvets. Welcoming and bright guest room features one king bed and a marble bathroom. This room features beautiful Breakers resort views and suits travelers looking for comfortable and oversized room accommodations. Guest-room experience includes a Flat screen TV and DVD/CD player, alarm clock, in-room movies, in-room check-out, WiFi, mini bar, hair dryer, private electronic safe, The Breakers private-label toiletries, plush bathrobes and slippers, luxury linens and duvets. Welcoming and bright guest room features two double beds and a marble bathroom. This room has beautiful Breakers resort views and suits travelers looking for comfortable and oversized room accommodations; perfect for families. Guest-room experience includes a Flat screen TV and DVD/CD player, alarm clock, in-room movies, in-room check-out, WiFi, mini bar, hair dryer, private electronic safe, The Breakers private-label toiletries, plush bathrobes and slippers, luxury linens and duvets. This welcoming and bright guest room features one king bed and a marble bathroom. This room features stunning partial ocean views and suits travelers looking for comfortable and oversized room accommodations. Guest-room experience includes a Flat screen TV and DVD/CD player, alarm clock, in-room movies, in-room check-out, WiFi, mini bar, hair dryer, private electronic safe, The Breakers private-label toiletries, plush bathrobes and slippers, luxury linens and duvets. This welcoming and bright guest room features two double beds and a marble bathroom. This room has stunning partial ocean views and suits travelers looking for comfortable and oversized room accommodations; perfect for families. Guest-room experience includes a Flat screen TV and DVD/CD player, radio alarm clock with iPod docking station, in-room movies, in-room check-out, WiFi, mini bar, hair dryer, private electronic safe, The Breakers private-label toiletries, plush bathrobes and slippers, luxury linens and duvets. Open and inviting spacious suite features two double beds, marble bathroom and elegant sitting area with sofa bed. This junior suite is perfect for families or travelers looking for oversized accommodations. The Junior Suite experience includes a Flat screen TV and DVD/CD player, alarm clock, in-room movies, in-room check-out, WiFi, mini bar, hair dryer, private electronic safe, The Breakers private-label toiletries, plush bathrobes and slippers, luxury linens and duvets. Open and inviting suite features one king bed, marble bathroom and elegant sitting area with sofa bed. This junior suite is perfect for families or travelers looking for oversized accommodations. The Junior Suite experience includes a Flat screen TV and DVD/CD player, alarm clock, in-room movies, in-room check-out, WiFi, mini bar, hair dryer, private electronic safe, The Breakers private-label toiletries, plush bathrobes and slippers, luxury linens and duvets. Magnificent Oceanfront guest room features two double beds, a spacious marble bathroom with separate shower and tub, private step-out balcony with breathtaking ocean views. This guest room is considered one of the resort's most desirable accommodations. Guest-room experience includes a flat screen TV and DVD/CD player, alarm clock, in-room movies, in-room check-out, WiFi, mini bar, hair dryer, private electronic safe, The Breakers private-label toiletries, plush bathrobes and slippers, luxury linens and duvets. Magnificent Oceanfront guest room features one king bed, sofa bed, spacious marble bathroom with separate shower and tub, private step-out balcony with breathtaking ocean views. This guest room is considered one of the resort's most desirable accommodations. Guest-room experience includes: Flat screen TV and DVD/CD player, alarm clock, in-room movies, in-room check-out, WiFi, mini bar, hair dryer, private electronic safe, The Breakers private-label toiletries, plush bathrobes and slippers, luxury linens and duvets. Luxurious and charming one bedroom suite features one king bed in the master bedroom, a marble bathroom and private living room with sofa bed. This suite features beautiful Breakers resort views and is the perfect choice for travelers looking for a separate master bedroom and living room. Suite experience includes a Flat screen TV and DVD/CD player, alarm clock, in-room movies, in-room check-out, WiFi, mini bar, hair dryer, private electronic safe, The Breakers private-label toiletries, plush bathrobes and slippers, luxury linens and duvets. Bright and inviting oceanfront junior suite features one king bed, a sleeper sofa, spacious marble bathroom with separate shower and tub, private step-out balcony with breathtaking ocean views. Suite experience includes a Flat screen TV and DVD/CD player, alarm clock, in-room movies, in-room check-out, WiFi, mini bar, hair dryer, private electronic safe, The Breakers private-label toiletries, plush bathrobes and slippers, luxury linens and duvets. Refreshing and spacious one bedroom suite features one king bed in the master bedroom, spacious master bathroom including bathtub with whirlpool features, separate shower and tub. 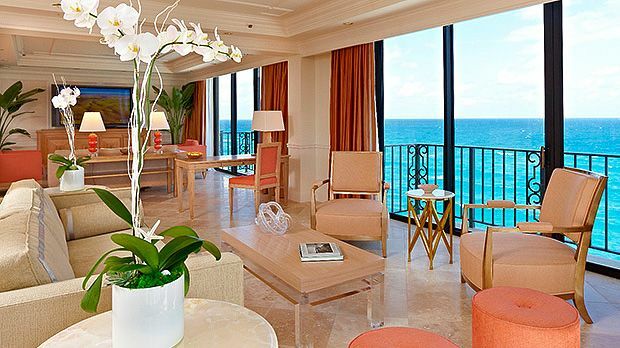 This signature suite features beautiful Breakers resort views or partial ocean views. Suite experience includes two Flat screen TVs and DVD/CD player, alarm clock, in-room movies, in-room check-out, WiFi, mini bar, hair dryer, private electronic safe, The Breakers private-label toiletries, plush bathrobes and slippers, luxury linens and duvets. Spacious and inviting one bedroom suite features one king bed in the master bedroom, spacious master bathroom, separate shower and tub, two private step-out balconies. This signature suite features beautiful Breakers resort views and is conveniently located close to the pools and beach. The suite experience includes: Two Flat screen TVs and DVD/CD player, alarm clock, in-room movies, in-room check-out, WiFi, mini bar, hair dryer, private electronic safe, The Breakers private-label toiletries, plush bathrobes and slippers, luxury linens and duvets. This breathtaking one bedroom suite features one king bed in the master bedroom, a spacious master bathroom, separate shower and tub, private living room with sofa bed and two private step-out balconies with breathtaking ocean views. Complimentary amenities include access to the hotel's fitness center, fitness classes, Wi-Fi Internet, personal concierge and a welcome amenity. This breathtaking and spacious one bedroom suite features one king bed in the master bedroom, spacious master bathroom, private living room with sofa bed and two private step-out balconies with breathtaking ocean views. Complimentary amenities include a personal concierge, welcome amenity and pressing when booked at rack and prevailing rates. This elegant and stylish one bedroom suite features one king bed in the master bedroom, spacious master bathroom, separate shower and tub, private living room with sofa bed, wet bar, guest half bathroom, six-seat dining area, three private step-out balconies with breathtaking ocean views. Complimentary amenities include a personal concierge, welcome amenity and pressing when booked at rack and prevailing rates. A top suite at The Breakers. Serene and inviting one bedroom suite features one king bed in the master bedroom, spacious master bathroom, separate shower and tub, private living room with sofa bed, wet bar, guest half bathroom, eight-seat dining area, five private step-out balconies with breathtaking ocean views. This signature suite includes a Personal concierge, welcome amenity and pressing when booked at rack and prevailing rates.